Collection of Paul Dunlop, 8-23-04 This picture was taken after Watson's first aeroplane was modified as a glider by the Dundee Model Aero Club in1910. It had refused to leave the ground under power in Watson's hands. The man, I suspect, is a member of the Dundee Model Aero Club. The sites your page links to continue the myth that he flew in 1903, but this has already been discredited by aviation historian Charles Gibbs-Smith. 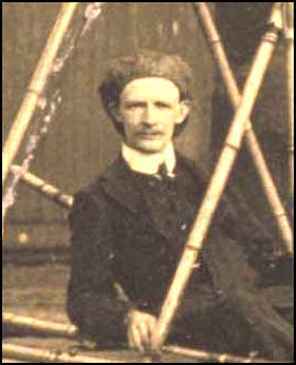 In his book, The Aeroplane, its origins and history, he states that the claimant, Preston's brother James, admitted that the aircraft Watson flew in 1903 was a glider. This also appears in the December 1955 issue of the magazine Aeronautics. James wrote and submitted that article himself. He was the origin of the "Powered Flight Before the Wrights" myth in 1953. The actual date of Watson's first powered flight has not been established, but evidence shows that he could not have made it earlier than 1910, the construction date of his second aeroplane based on its engine type, a 30 hp Humber - first produced that year. The story of him acquiring an engine from Santos-Dumont could not have taken place earlier than 1909, since the engine fitted to his first aircraft was a 1909 - 1910 Dutheil Chalmers four cylinder 20 hp engine. The Curator of Aviation and the French Musee de L'Air at Le Bourget in Paris verified this from photographs of the engine fitted to his first aircraft. As far as what can be verified, Preston Watson built three aeroplanes, in 1909, 1910 and the last in 1913, of which only the last two got airborne under their own power. The earliest pictorial evidence showing one of his aircraft in flight are two grainy images in the May 15 1914 issue of Flight magazine. These show his second machine in flight at Errol in Perthshire in 1912. There is no substantial evidence to support the claim Watson flew anything in 1903, the eyewitness accounts cannot be relied on for accuracy or consistency since they were made at least fifty years after 1903. He was only 22 years old at the time, and never made such a claim himself. There is a three page article in Flight magazine that he wrote about his flying experiments. I hope these facts help give you a little more info on Preston Watson, there is much untruth out there, and sorting it out can be problematic. Did He Fly Before The Wrights? by J.F. Riley This article, which is found on the Homepage of Chris Brady, London, England, offers a very complete and interesting biography of Preston. Evidence is presented which serves to confirm the claim that he flew before the Wrights. Included is a photograph of his plane and a plan which shows how he used a catapult to launch his glider. To access the site, click on the title above. by Gordon Casely " This article, which is found on the Leopard, the Magazine for North-East Scotland, offers a very complete and interesting biography of Preston. Included is a photograph of his plane . To access the site, click on the title above. "HE rubbed his eyes in bewilderment, blinked twice and looked again. For Harry Band, a Scots soldier on leave, it was almost impossible to take in what was happening right there in front of him. Soaring across the blue sky high above the River Tay was a strange contraption that touched down for a second and then hopped back in to the air again." The excerpt above from the article introduces the story of Preston Watson and his flight in a powered aeroplane some months before the flight of the Wrights. The author, writing for the Daily Record, tells the whole fascinating story of his trials and triumphs. The eyewitness, Harry Band, was still alive in 1955 and recounted his observations of the flight and confirmed that it had been in mid 1909. To read the whole fascinating story, you can access the site by clicking on the title above. Most of the other links only offer a statement to the effect that he was among the first to achieve powered flight. Preston Watson died in 1915.